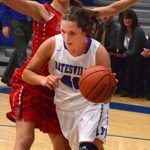 Tuesday, December 20, 2016 7:30 PM Batesville High School AWAY 39 Columbus East High School HOME 51 Game Recap The Lady Bulldogs suffered a 51-39 loss at Columbus East. Batesville trailed 21-18 at the end of the first quarter and later 33-25 at halftime. Gabi Garcia led the Lady Bulldogs in scoring with 15 points.